Is your pay-off paying off? In 2007, Brandhome started a qualitative research asking 330 consumers about 250 brands and their pay-off, better known as ‘baselines’. The results were strong enough to propel the press release unto the pages of many a newspaper. Which brands stayed afloat and which brands were sinking into the murky depths, dragged down by their poor pay-off? The latter category was populated by 10 pay-offs that were attributed to the wrong brand. (% = percentage of recognised but wrongly attributed baselines). This research was conducted to support the Brandhome method®. Brandhome believes that a powerful pay-off has to fit the brand identity, positioning and all-round brand experience. A lot of brands underestimate the value of consistency in communication, with the pay-off as its top priority. Brands change their ‘pay-off’ and their positioning too often. Without these values, a campaign can miss the mark and the consumer will forget the brand before the campaign is well and truly off the air. The research has shown that some big advertisers are in more trouble than they might think. Some were recognized, not recognised, or worse: recognized but attributed to the wrong brand. Some very popular brands did not pass the test. 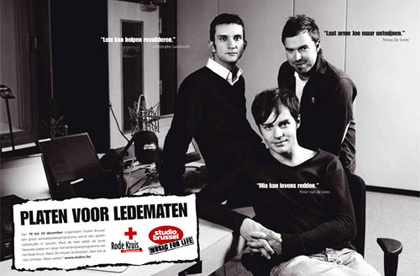 The ‘Life is music’ pay-off by Studio Brussels was attributed to their biggest rival Q-Music by 54 % of consumers. Toblerone scored the lowest of them all. 70 % of the people thought “Chocolate with character” belonged to Cote d’Or (‘the power of real chocolate’). Where there are losers, there are winners. There are pay-offs that were correctly attributed by the majority. ‘Gives you wings’ and ‘freedom of speech’ and ‘men know why’ by Red Bull, Base and Jupiler were the clear winners. More than 80% of the consumers recognised these pay-offs and connected them to the right brands. Why? Red Bull has been using the same pay-off forever. Their sponsored events also ‘give you wings’: this means the pay-off is consistent and also consistently used. BASE owes its high score to ‘freedom of speech’ because ‘freedom to communicate’ fits the profile of a provider so well. These 10 pay-offs were attributed to the correct brand. (% = percentage of recognised and correctly attributed baselines). And then there’s the category of pay-offs that were not recognised, nor attributed. Carrefour lost out with their ‘en everything becomes possible’. Not a big surprise, because really, every brand could possibly use that one. The banking industry received some extremely poor marks. Axa ‘live full of confidence’, ING ‘a clear view will get you there’ were seldom recognised. 0% of consumers recognised these three pay-offs. After ‘priming’*, about 50% recognised the brand. The pay-off mostly remained in obscurity. The last category is filled with 10 pay-offs that remained unrecognised and could not be attributed to a brand without priming*. The results of this research were the foundation of the following tips to bolster your brand. Consumers ‘rate’ a pay-off when they are able to assign it. If they feel the pay-off is not relevant to the brand experience or the brand’s future; they will disapprove of the pay-off because they regard it as a false promise. First impressions matter (e.g. Carrefour: ‘and everything becomes possible’). Adding a third dimension (symbolism) to your communication will fortify the link between brand and pay-off. The brand – pay-off – symbolism triangle will harness the power of association, helping the consumer remember brand and pay-off correctly. Pay-offs that are used consistently for a longer period of time, will be better recognised, attributed and appreciated. They will become part of the brand identity, as it were. There’s a clear difference between brands who consider their pay-off to be a campaign header and those who consider it to be part of their identity. Stay true to yourself, no matter what happens. These tips will make consumers prick up their ears when your brand starts broadcasting. The relationship with your consumer is so fragile, there is no time for dull moments. A strong link between brand and consumer is created by… you! Keep it exciting, OK? *Priming: giving indirect indications and stimuli to trigger specific memories or associations in the respondent’s memory or subconscious, before or during qualitative research.